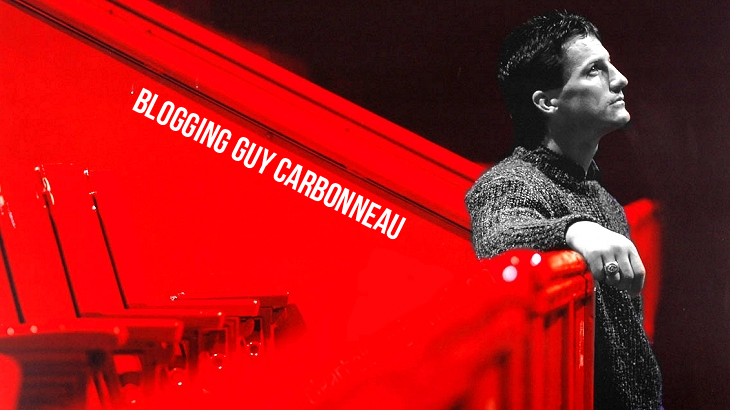 As mentioned previously, I've been collecting Carbonneau memorabilia for about four years. In my collection I have about 100 of his hockey cards. In the beginning, most of these were his old issues -- when the card companies started coming out with "legends" cards, Guy just wasn't getting his due. But in the last few years, many new Carbo cards have been issued, which delights me. Here are a few of my favorites from his recent issues. This is Guy's most recent offering, a 2011-12 Parkhurst Champions card. I like this one because of the picture the company used -- it's an older one -- plus the card has sort of a holographic look to it, which I also like. Over the years, the amount of "spiffy" cards Guy has had have been very few. This is a 2009-10 O-Pee-Chee card. Again, I like this one because of the picture -- an action shot of Guy from the 1993 Stanley Cup Final. I am very torn on the subject of "game-worn jersey" cards. On one hand, it gives those who otherwise might not be able to afford such memorabilia a chance to own a piece of a jersey. On the other...Carbo's game-worn jerseys are being cut up to make cards, which breaks my heart. This is a 2008-09 SPX Flashback Fabrics card. This is a rare and unusual card. It incorporates a piece of Carbo's fight strap. Also, it's a game-worn card featuring him in a Dallas uniform, which you just don't see at all. There were only two of these cards made, and it is a 2009-10 SP Famous Faceoffs card. This last card, I am featuring because it is signed by Guy in addition to being a game-worn card. This card has a piece of his jersey nameplate and is a 2008-09 SP Letter Marks card.